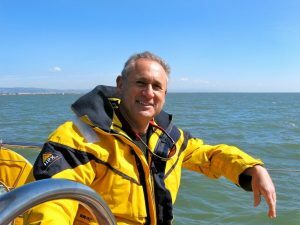 Larry Jacobson spent 6 years of his life sailing around the world – leaving from and returning to San Francisco California. 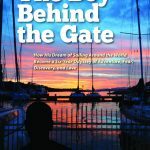 Recently we had a chance to ask him a few questions about sailing, his 6-year trip and his new book, “The Boy Behind the Gate“. Q. You are a prolific sailor – tell us how you first discovered your love of sailing? When I was 13 years old, I crushed both bones in my leg while skiing. I was laid up for 3 months in a cast from hip to toe, and during that time, dreamed of not ever being stuck in one place again. I wanted the freedom of moving. My brother brought me home an old beat up dinghy he found in a garbage dump and I thought I was looking at a super-yacht. I taught myself to sail and knew I had found my heart in boats. Q. I am currently reading your first book, “The Boy Behind the Gate” and am really enjoying it – especially since my brother is in Puerto Vallarta now preparing for his big sail across “the pond” to the South Pacific. What inspired you to essentially take 6 years of your life and sail around the world? To a mountain climber, it’s Everest. To a sailor, it’s circumnavigation that is the ultimate. Sailing around the world had been my dream since I was 13. I saw a glimpse of a chance to act on that dream and went for it. I had no idea I would be gone 6 years or spend all of my money, or even write a #1 ranked book. All I knew was that I was going to try and make my original dream come true. Q. Tell us how you came up with the name of the book and what it means. I know you live behind the “golden gate” so to speak, but that’s not the reason you came up with the name, right? Thirty years later, when we were sailing down the coast of California at the beginning of the six-year odyssey, and stopped in Long Beach for a few days, I noticed that we were docked inside the exact gate I used to stand behind as a boy. The boy behind the gate had moved right on through. Q. What advice do you have for those thinking of making a career change, one that might involve a bit more risk than what they are currently doing? You have to take a risk in order to achieve results. You can’t make it to the other side of the ocean without leaving sight of land. To put it in terms that everybody can understand, you can’t steal second base without taking your foot off of first. Is it scary to take a risk? Absolutely. Accept the fear, accept that you are in new territory and enjoy that process. Q. In light of the terrible Tsunami that recently hit Japan where were you for the big 2004 Tsunami and were you affected at all by this? Did you know other sailors who were affected by this? Any stories about this? This was a huge story for us and is chronicled in the book in detail. We had originally planned to be anchored right at Patong Beach on Christmas. We had all of our plans set until a few weeks before, when my partner Ken woke up one morning and said that he wanted to go back to the states and be with his family for Christmas. He asked if I would mind if we changed our plans and headed home instead of the Christmas party at Patong Beach. That decision saved our lives. It also saved our boat because we hauled it out to have some work done while we were gone. 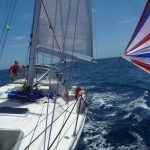 We knew lots of sailors affected including our friends Rob and Suze who’s boat was damaged so badly, they had to leave it in Thailand. They continued across the Indian Ocean and through Pirate Alley with us on JULIA. Q. One of the perks of a long sailing trip such as yours is you meet a lot of other “cruisers”. Tell us about this unique comradery that exists among cruisers and what sounds like a general willingness of most sailors to pitch in and help out others. It’s an incredible community and was one of the best things about the entire trip. People gave food, water, spare parts, and most of all, their time and expertise to all fellow cruisers. Ken is a computer engineer so we used to get radio calls all the time asking if he could come over to help with a computer problem. We never charged anybody for this and nobody ever charged us to help fix our engine, or myriad of other things that broke down. Q. From my experience with sailing, it seems like things are always breaking. Is this true? And how to manage this on a round the world trip? LOL, YES, things are always breaking. 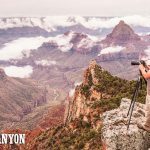 We started our trip with nearly all new equipment and over six years, almost everything broke in some way. Salt water corrosion is a killer on electronics, rubber, steel, and hoses. We started out with very little knowledge about fixing things; just our instincts. We asked for the help of other cruisers, and when we had major issues like needing to rebuild the engine, we turned to professionals. At the beginning of the trip, all of the breakdowns really got to me. By the end of the trip, I was laughing about them. Turns out that the only thing that had changed was my attitude. Q. I would do a long distance sailing trip in a heartbeat – the freedom of this type of type of travel must be incredible. However past sailing excursions have always resulted in terrific sea sickness (and that’s putting it mildly!). How does one deal with this if they have a “weak” stomach? Does one get over this if seas remain rough after a few days? There are a couple of really good seasick cures: Stugeron is the best pill, but it’s not sold in the U.S. It can be found in Canada, Mexico, and most other countries though and is highly recommended. There is a new product MotionEze that is drops you put behind the ears and that works medium-well. And of course, the ultimate in emergency is a scopolamine patch but it has side effects if you wear it longer than a day or two. Seasickness goes away after about three days, but to get through those first days, I highly recommend Stugeron (forte, 75). Q. For those who haven’t yet read your book or may not have sailed before, bad weather is a part of sailing. What was the scariest moment you had while sailing during your six-year trip and or where did you experience the worst weather and how did you handle it? We were pretty good at reading the weather, and knew enough to sail in hurricane zones in the wrong season. However, a weather forecast loses its accuracy by up to 20% per day, so a week at sea can see some significantly different weather than forecast. 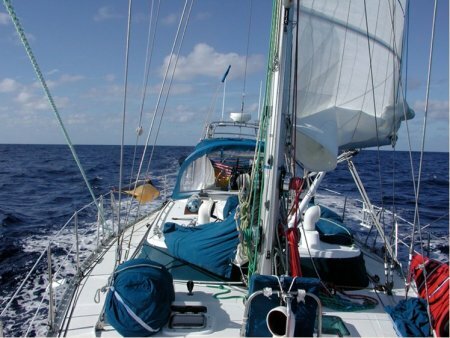 On our 11-day passage from Vanuatu in the South Pacific to Australia, we were hit by gale force winds for days on end. We were also caught in two gales between Tonga and New Zealand. The worst we ever had though was the biggest storm I’ve ever been in which was in the Red Sea. The Red Sea is very difficult to forecast and we got caught in a front that came 24 hours earlier than forecast and hit us with 55 knots of wind for over 24 hours. Seas were 30-foot, no kidding. That’s the size of three-story houses and they were coming at us every 3 seconds. It was 24 hours of fear and struggle, but we made it through and are stronger people from having gone through that and all of the bad experiences. Bad weather is definitely part of cruising and you have to be prepared to deal with it. Q. 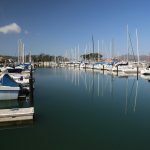 While you were raised in Long Beach (south of Los Angeles) you currently live in the San Francisco Bay Area – what are some of your favorite activities and or places to visit in the “Bay Area”? To me, the entire Bay Area is a playground and I love being a tourist in my hometown. I bike ride along the bay through Berkeley and the bird refuge. I take in sushi bars in Berkeley and Italian restaurants in San Francisco. Recently, I even went on the Alcatraz tour which believe it or not, I had never taken. My favorite thing is to walk across the Golden Gate Bridge. For me, there is special significance having sailed out underneath and then back six years later. I get emotional every time I look out to sea from that vantage point. This is taken from a poem in the beginning of my book, The Boy Behind the Gate. It’s called, To Live on the Edge. Do I go or do I stay. I’d like to add that my book is inspiring many readers to live their dreams, no matter what they are. It’s universal in its appeal and I hope it changes somebody’s life for the better. A California native, Larry Jacobson grew up on the beaches of the Pacific Ocean sailing, kayaking, swimming, and scuba diving. 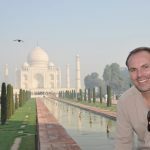 A recognized expert in the corporate marketing world, he was president of one of the premier incentive travel companies. An avid sailor, he has over 50,000 blue water miles to his name. Larry is a motivational speaker and lives in the San Francisco Bay Area.